I am barely five feet tall. Of course I would often say that I'm 5 feet when asked casually, knowing that 4'11'' is just an inch away from 5 ft anyways. (And, my grade school Math teacher used to say I can round off numbers, you know). Aside from the experience of wearing high heeled shoes during rare events such as proms and my very own wedding, I only got to wear them longer than a year when Havaianas wedges were popular years ago. We partied ways because hubby says it looks weird on me and he's kinda not trusting the way I walk. He says I walk so carelessly, not looking straight to where I am headed, and I could stumble and hurt myself any minute just by looking at me. From then on I shied away from heeled shoes. Besides, I love flats. They are comfy and carefree like that. Then one funny thing happened a week ago. I was in a bloggers' event for a beauty brand in a mall, and we (me and my fellow bloggers) posed for a group shot. I stood on the second row, tipped my toes to give the illusion that I'm not that short, even just in that photo. When I saw the photo on Facebook the following day, I don't know (in funny kind of way) if I should laugh or feel sorry for myself because only the tip of my head were showing in the picture!! Ugh. At my age, there is no way I am getting taller than my current height even if I take a hundred of capsules of growth vitamins or eat loads of calcium-rich food. And so, I said to myself, this is it. I am giving myself a second chance to wear these toe-constricting, blister-machine called heels and wedges. The universe was somewhat conspiring with me because shopping malls were on having a sale. 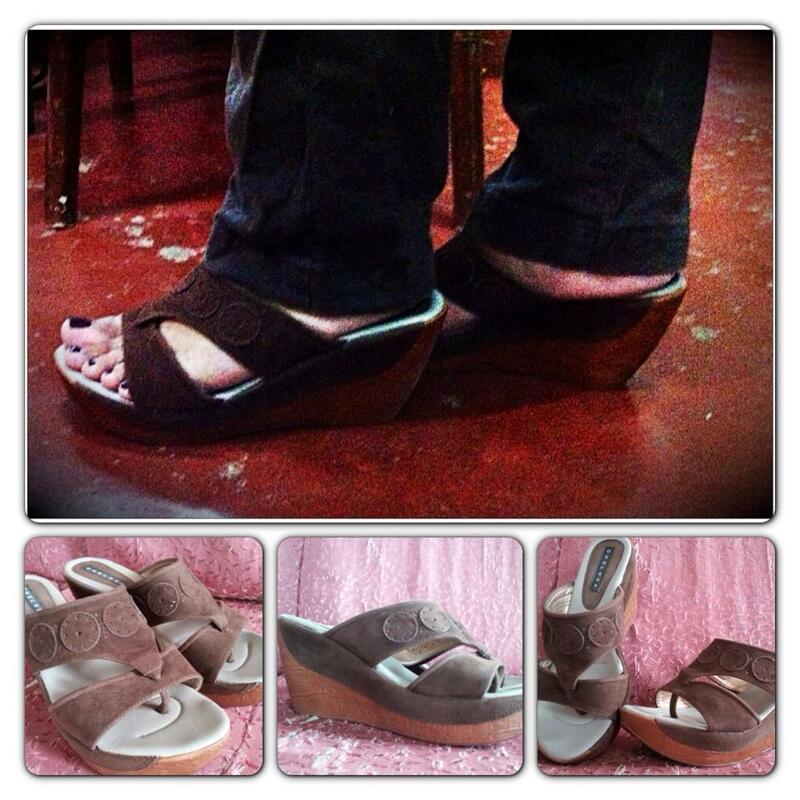 After trying on a few, I finally got myself a nice and comfy wedge made by Chelsea ( free endorsement! ), which is neither too high or too low. Just enough . And it is priced reasonably too at around 800 pesos. I know that it is perfect because it is not too heavy on my feet and mind you, I have zero blisters from the day I bought it a week ago till now. Plus, I look taller, yay! My daughter jokingly told me that I look somewhat different, she would sometimes mistake me for someone else. Hubby also says that, with the new wedge, I now walk like a lady. Hmmmm. Is that a good thing? Of course, it is! Well, that is just about my little happy ending in the footsie department. And as they say, a girl couldn't own enough shoes, chances are, I might be getting another pair of wedge soon. How about you, have you rediscovered something, lately? Share! 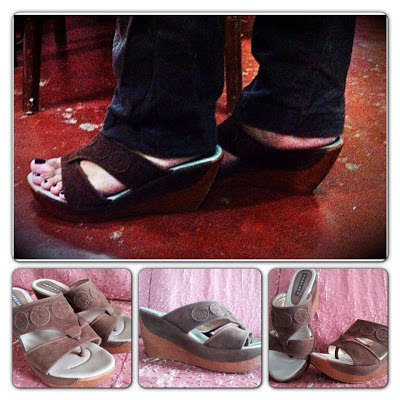 Trivia: A Wedge heel is defined as the heel which is an extension of a shoe's sole. We have the same height hehehe... I love flats but I also love shoes with heels for the same reason that I want to be taller somehow..
knowing the right shoe is what we should have esp if we use them often in our daily walk.. Thanks for following my main blog sis, already a follower here. If you have more that you want me to follow just leave the url to my blog.. Thanks. I prefer a wedge over stilettos any day. I am such a klutz but since I am a midget myself, it's always nicer to feel an inch or two taller. Women should often wear wedges or heeled shoes. They look very feminine with it and elegant as well..
That is from a guy's point of view. Ehem. My husband also calls me clumsy.. Nature ko na din ata yun.. Hehehe.. Good thing nalang siguro at di ako nahilig sa shoes na may heels, kundi, dami ko siguro laging "booboo".. =D I love flats! Di ko rin kase gaanu carry magsuot ng may heels at di ako sanay.. I only wear formal footwear on special (very rare) occasions..
Wedges and high heels shoes is good not for the added height it gives but mas social ang dating mo.